This time we are talking about one of our favorite tourbillons in the market, the Audemars Piguet Royal Oak Offshore Tourbillon Chronograph ref. 26288OF.OO.D002CR.01. This is a grail for many watchlifestylers and one hell of a watch. This Offshore is not only one amazing horological complication, but perhaps one of the Audemars Piguet Royal Oak Offshore Chronographs with the most mesmerizing wrist presence. This robust timepiece featuring a tourbillon, also features an integrated column wheel 30-minute chronograph —quite a complication. This watch is fitted with an 18K pink gold case measuring 44 mm in diameter and 16.60 mm in thickness, an anti-reflective coated sapphire crystal, an anti-reflective coated display case back, a forged carbon bezel, a black ceramic screw-down crown and black ceramic chrono pushers. The case on this particular watch features four carved out corners on the top of the case —near the lug areas—, carved out plots and a perfectly brushed finished case with exuberating 'chamfers' very typical of Audemars Piguet Royal Oak and Royal Oak Offshore timepieces. The openworked dial on this watch features a 30-minute chrono-register in grey and silver at 3, a tourbillon at 9 o'clock and two openings at 12 and 6 o'clock. The black dial features contrasting pink gold Arabic numerals, pink gold hands with luminescent coating, a black flange with tachymetric scale and chronograph hands with red tips to round up its perfectly balanced configuration. The beating heart inside of this iconic reference is the hand-wound Audemars Piguet calibre 2912 composed of 328 parts, 30 jewels and which provides a power reserve of 237 hours —almost ten full days— when fully wound. Yes almost ten full days and this is not a typo. This amazing calibre is fully visible via the display case back and the wearer will be able to contemplate the column wheel chronograph mechanism, the locking gear stopwork, the twin barrels in parallel, the anodized aluminum bridges and of course the back side of the tourbillon. A real treat for the eyes and something that can amaze you for hours. Seeing one of these watches in person and being able to peruse it, is something out of this world. Thank you Audemars Piguet. The Audemars Piguet Royal Oak Offshore Tourbillon Chronograph is fitted with a black large square scale hand-stitched alligator strap with folding buckle in pink gold that when fastened it almost appears to be a pin buckle. 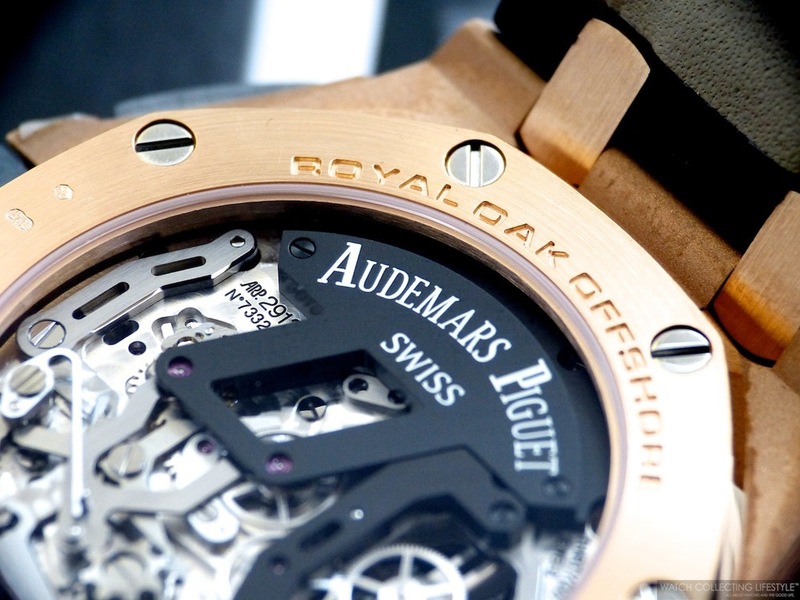 The strap, just as any other Audemars Piguet strap, is extremely comfortable and perfectly finished. You really couldn't expect any less from a manufacture like AP and from a watch within this price point. Even though the watch is waterproof to a depth of 20 meters, we really wouldn't get this gorgeous strap soaked. As mentioned earlier, the wrist presence is unparalleled and mesmerizing. Once you put this watch on your wrist is game over. Nothing else that you put on afterwards —unless it's a Royal Oak Offshore Grande Complication in Titanium of which only three pieces were made— will make you feel as good as when wearing this fascinating Offshore. Now, be ready to pay if you want to play, because a timepiece of this calibre doesn't come cheap at all. Even if you can pull off a good discount, certainly you won't be paying less than a quarter of a million dollars for it. Sticker Price $299,300 USD. 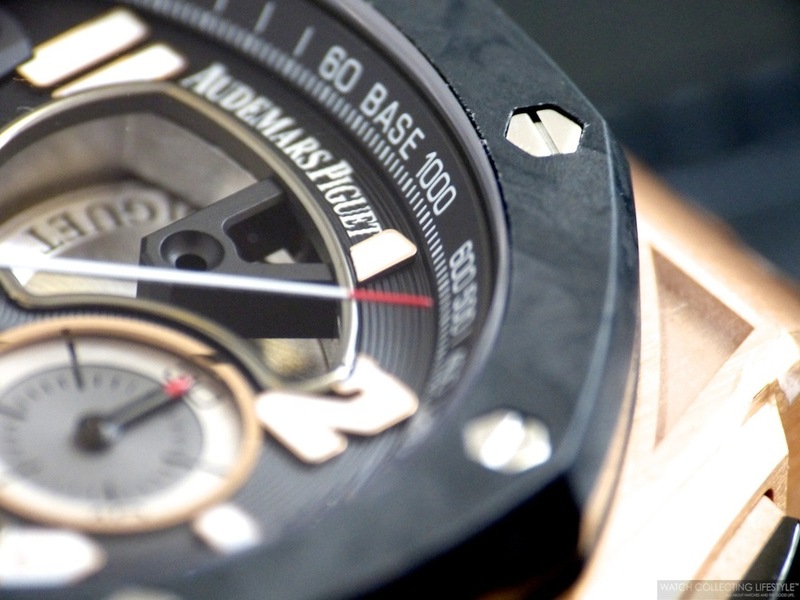 For more info on Audemars Piguet click here. Posted on August 11, 2014 by Editor & Publisher and filed under Audemars Piguet and tagged Audemars Piguet ref. 26288OF.OO.D002CR.01 Audemars Piguet Royal Oak Offshore Tourbillon Chronograph Posts 2013 Most Popular 2014.